Newest Nord Piano 4 remains exceptional in its piano feel while delivering seamless transitions, dedicated Piano Filters and Split Point Crossfades. With outstanding new keyboard technology, improved grand weighted action and expanded memory for the exclusive Nord Piano Library - the Nord Piano 4 takes piano feel and realism to a new level. The Virtual Hammer Action Technology simulates the movement of the hammers in a Grand Piano, capturing the characteristics with exceptional dynamics and breathtaking level of authenticity. 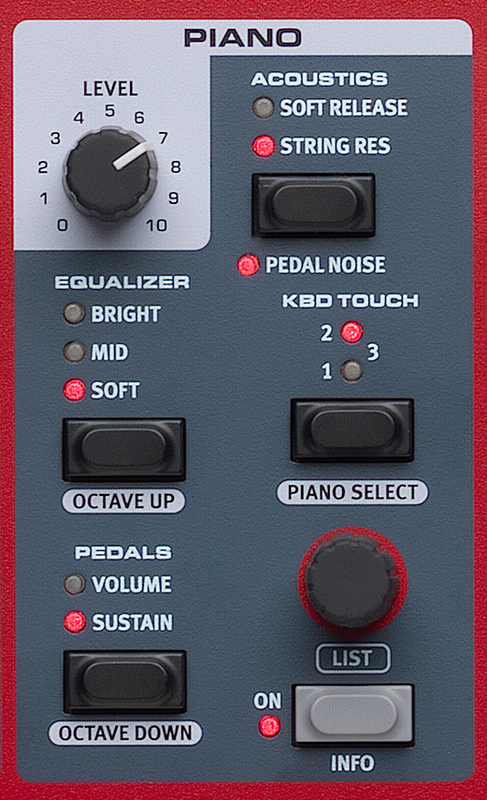 The Nord Piano 4 has dedicated knobs and buttons for all essential functions required in a live performance situation. Transposing, setting up a split point or creating a layered sound can be accomplished in seconds. The Nord Piano 4 features seamless transitions when changing sounds or programs while playing. The Nord Piano 4 features two sound sections that can be combined in a layer or split over the keyboard. Each of the sound sections can have specific effects, Volume Pedal and/or Sustain Pedal assigned to them. The Piano 4 has 7 Split Points indicated with LED lights and the new Split Point Crossfade functionality, introduced with the Stage 3, offers smooth transitions between two split zones. Choose from 3 different crossfade widths (Small, Large or Off) as indicated by different LED colors. The enhanced Organize mode includes Copy/Paste and Move functionality for quickly rearranging your Programs to your desired order and a new Page View lets you easily sort and organize pages as a song list. All Programs, Pianos and Synth Samples can be easily navigated using the new uniform List View that offers alphabetical, numerical and category sorting options. An optional new Numeric Pad Mode gives you instant access to Programs by entering the Program number. The enhanced Piano section features a broad selection of our latest acoustic, electric and digital pianos from the exclusive Nord Piano Library, greatly expanded voice polyphony and creative new Piano Filters. 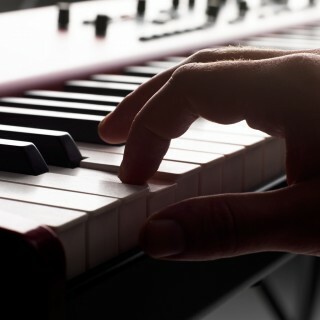 The N ord Piano 4 factory bank contains our latest Grands, Uprights, Electric Pianos and Digital Pianos from the exclusive Nord Piano Library - all handpicked for their unique characters! 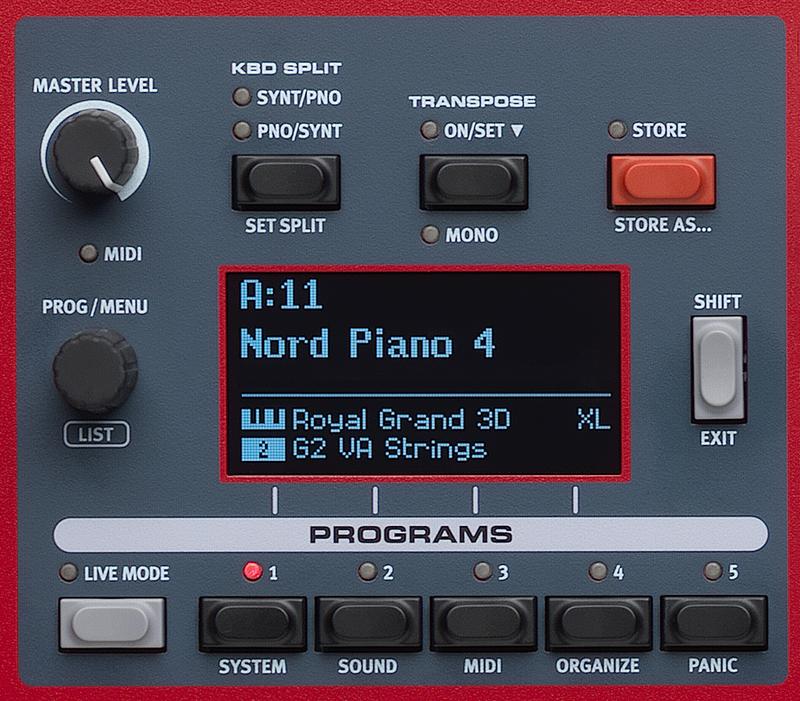 Nord’s state-of-the-art sampling techniques capture the extraordinary nuances and real character of the source instruments with breathtaking realism. All sounds can easily be replaced using the Nord Sound Manager. Our exclusive Nord Piano Library is constantly updated with new unique world class sounds, and always free of charge. Our unique Advanced String Resonance reproduces the intricate interplay of piano strings resonating at their fundamental or harmonic frequencies when other notes are played on our Upright and Grand piano sounds. Providing an additional level of sonic control, the Piano Section now features dedicated piano filters for accentuating softness, mid or brilliance. The exclusive Virtual Hammer Action Technology, introduced with Nord Piano 3, simulates the hammer movements in a Grand Piano delivering outstanding authenticity and dynamic response. The Triple Sensor keybed allows key movements to be determined with stunning precision. The result is a keyboard action that handles dynamic playing with amazing control at any velocity level. The Nord Virtual Hammer Action Technology enables you to produce a new note without lifting the key completely. This allows for smoother repetitions as the tone is not completely dampened between the strokes, similar to the fluent transitions possible on a Grand Piano. The new keyboard technology makes both top and bottom triggering possible, resulting in amazing control when playing percussively as well as pianissimo with the keys half-pressed down. The keybed has added weight for improved dynamic control providing authentic Piano touch and feel. The individual Fatar keybeds are meticulously calibrated at the Nord factory to ensure an even response over the whole range. 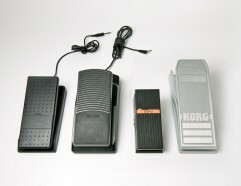 The included Nord Triple Pedal includes Soft and Sostenuto Pedals in addition to a unique Dynamic Sustain Pedal. The Triple Pedal also enables our Pedal Noise feature that dynamically simulates the mechanical sounds of lifting and releasing the damper mechanism. A Soft Release-mode adds a slightly longer release, more suitable for legato playing, emulating a looser damper tension in an acoustic or an electromechanical instrument. 3 dynamic curves are available to suit your playing style, from soft to hard. The Sample Synth Section features expanded memory for the Nord Sample Library 3.0 and extended voice polyphony. The Sample Synth Section contains a great selection of high quality sounds from the Nord Sample Library 3.0 including the exclusively licensed sounds of the legendary Mellotron and Chamberlin. All sounds can be quickly replaced using the Nord Sound Manager. 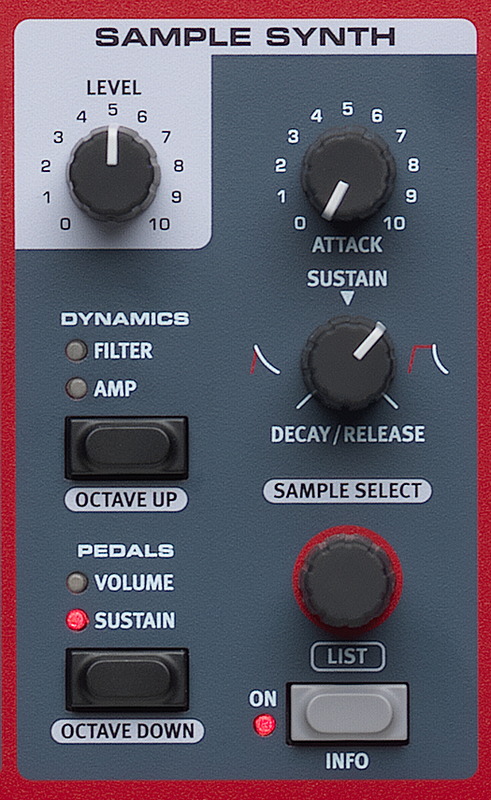 The Sample Synth is equipped with essential controls for attack, decay/release and dynamics (filter/velocity). 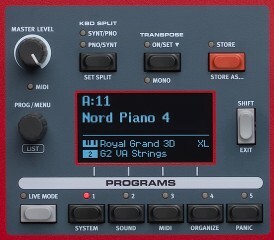 A unique Nord feature allows you to create your own samples using the free Nord Sample Editor software for WIndows and Mac. The Effect section features a great selection of instantly tweakable high quality stereo effects modelled after classic stomp boxes. All effects can be assigned freely to the Piano or Sample Synth section. Wah-wah and Ring Modulator. All effects can be controlled with a Control Pedal. Effects 2 - Phaser, Flanger, Chorus, a new Vibe effect and two selectable depths for each effect. Compressor/Amp - Twin, JC, Small, Compressor and a new Tube Overdrive effect. Reverb with three modes - Room, Stage, Hall each with a Bright option. Connect your MP3 or CD player to the rear panel Nord Piano 4 monitor input to play along, rehearse to or jam with previously recorded music without the need of an external mixer or sound system. The signal will be monitored through the headphone output. Control/Volume Pedal support has been improved and now supports the following pedals: Fatar, Yamaha FC7, Roland EV-7, Roland EV-5, Korg EXP2 and Korg XVP10.